Tell your colleagues about NOVA...Recruit new members...WIN EXCITING PRIZES!! 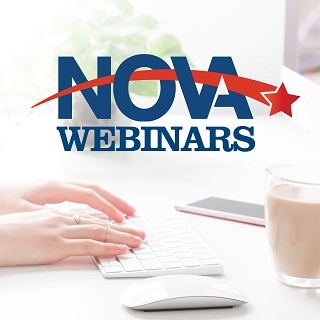 For each new member you recruit, you will receive one entry into a quarterly drawing for a chance to win one free year of NOVA Membership Dues (limit of one free year of membership per winner per year). The NOVA fiscal year (January 1-December 31) is used to determine the number of new members who have joined as a result of your recruitment efforts. Membership recruits must list your name on their membership application under “Recruited by” so you will get credit for their membership. If you recruit a new member on payroll deduction you will receive credit for that new member when they appear on the National Office payroll deduction report. New members must submit a completed membership application with payment (online, check or via payroll deduction report) in order to be counted. Recruitment totals will be calculated in January 2020 so that the appropriate prize(s) can be sent to you based on the number of new members you have recruited. Only current NOVA members are eligible to participate in the NOVA Member-Get-A-Member Program. There is no limit to the number of potential members that can be recruited by a member. Don't forget to have membership recruits write your name on their membership application under "Recruited By" so you will get credit for their application!